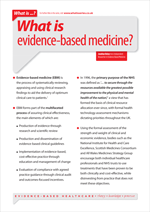 What is evidence-based medicine? | Whatis Series...? Using the formal assessment of the strength and weight of clinical and economic evidence, bodies such as the National Institute for Health and Care Excellence, Scottish Medicines Consortium and All Wales Medicines Strategy Group encourage both individual healthcare professionals and NHS trusts to use treatments that have been proven to be both clinically and cost-effective, while disinvesting from practice that does not meet these objectives.